DHC enjoyed the opportunity to help the community with a volunteer day for the local chapter of Habitat for Humanity. 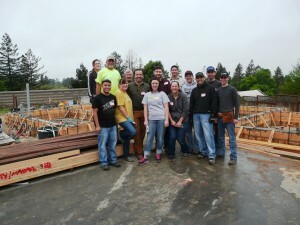 We met at the project site in Cotati, CA, where a new house was being built for a very appreciative family. Habitat for Humanity does not simply give away houses; the families have to go through a rigorous application process. Each family has to currently live in sub-par housing, and meet certain income requirements. After they are selected, Habitat requires the families meet a 500 “sweat hours” goal, which means they get to help build the home they will soon be living in. Our volunteer day started with meeting our job site foreman, who showed us the safety equipment, introduced us to the other volunteers, and handed out the day’s assignments. That day they were pouring concrete foundations, building re-bar cages, putting up a fence and performing general jobsite maintenance. Right off the bat, Mark and Chris were assigned to help with the foundation construction by leveling out freshly placed concrete. 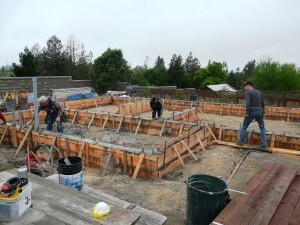 While the foundation was being poured, another group was assigned the task of tying rebar cages for the next house to be built. Each rebar cage required 30+ wire ties, twisted by hand, which secured the 4 vertical bars spiral reinforcement. Nick, Robin, Josh & Katy gained a new appreciation for how much work is involved in fabricating the rebar they often design and detail on DHC design plans. Finn was initially given the assignment of clearing the large yard areas, with brush and weeds reaching over 4’-high. After a steady dose of weedwacking, he handed off the job to James, who geared up with orange protective gear. You never can be too safe! 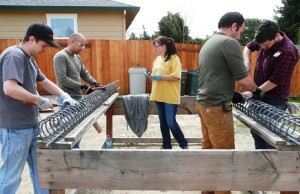 The final group, including Luke, Ashley & Jenn focused on building the backyard fence. After a feudal attempt to dig the postholes by hand in the extremely hard soil, a jackhammer was brought in, and the fence progressed quickly. 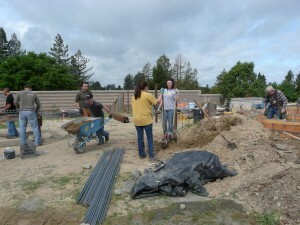 Many of the group rotated between tasks, including setting posts, ensuring fence alignment, moving dirt and pouring concrete. We learned that having DHC volunteer for the single day, saved Habitat for Humanity over $3,000 in labor costs. Habitat and the eventual building residents were extremely grateful, and the DHC team thoroughly enjoyed putting some “sweat hours” of their own into an extremely good cause. Stay tuned for a report from the Southern California DHC’s community service day! This entry was posted in Community Service on March 29, 2015 by Jasper Calcara.